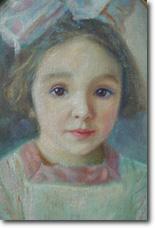 Theodor Wacyk was born in 1886 in the Galician village of Kolodziejówka, now Kolodiivka in present-day Ukraine. 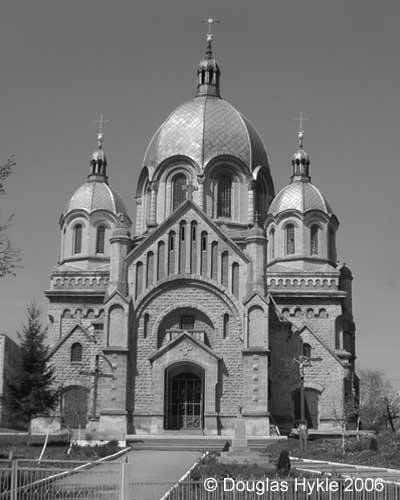 Theodor spent his youth and attended the Ukrainian Gymnazium in Tarnopol (Ternopil). Having shown artistic talent at a very early age, in 1904 he was enrolled at the Academy of Fine Arts of the former Polish capital of Kraków. He studied there under a number of accomplished artists and won many prizes and honours. After completing his studies in 1909, he continued his artistic education in Vienna, Munich and Venice, before settling in L'viv between 1910 and 1914. At the outbreak of World War I, Theodor Wacyk volunteered in the Austro-Hungarian Army and was posted on the Italian front. 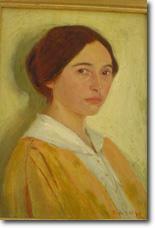 While in Italy, he married Maria Battisti (pictured here) and the couple had a daughter, Theodora, in 1918. At the end of the War, he joined the Ukrainian struggle for independence in the Ukrainian Galician Army, and advanced with his unit nearly as far as Odessa. At the end of this unsuccessful struggle, he returned to his family in northern Italy to pursue his artistic work. The couple separated within a few years, and Wacyk’s wife and daughter emigrated to the United States. Theodor left for Czechoslovakia, settling in Transcarpathia and northern Moravia. There he combined teaching with his artistic work, painting the frescoes of the Greek Catholic church of Velyki Kom'iaty in 1931-32. Theodor Wacyk remarried in 1933, and he and his new wife returned to his hometown of Tarnopol in 1935. In the late 1930s or early 1940s, he was commissioned to paint the frescoes of the recently completed Greek Catholic church of Tovste. Further research is needed to determine whether or not any of the original frescoes remain. The church was repainted in 1968 and the interior was thoroughly renovated again, around 2005, so it is quite possible that his work is no longer on display. Within a few years of painting the frescoes in Tovste, Theodor Wacyk left Ternopil definitively, eventually settling in Germany, in the Bavarian town of Plattling, where he continued his work until his death in 1968. Theodor Wacyk’s artistic path was interrupted by two world wars. Many of his works were lost during World War II and were never recovered. His frescoes in the Greek Catholic church of Velyki Kom'iaty in Ukraine have survived. His portraits, landscapes, nudes, still-lifes (usually floral), figure compositions, genre paintings – done in oils, pastels, watercolors, ink and pen – are treated realistically with a tendency to impressionism. His works of a religious nature – church frescoes, icons – are done in neo-byzantine style. 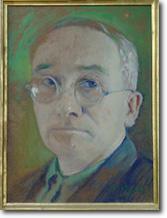 His paintings are known to be in the National Museum in L'viv (Ukraine), the Museum of Local Lore in Ternopil (Ukraine), the Ukrainian Museum in New York (United States) and the KUMF Gallery in Toronto (Canada), as well as in private collections in Italy, Belgium, United States, Germany and Brazil. Footnote: Apart from this prolific artist’s connection to Tovste, what makes the story of Theodor Wacyk so fascinating is how it came to be uncovered by his granddaughter (from his first marriage), Jaqueline Bernard, who has provided the contents of the account written above. Having been under the impression that her grandfather died in 1920, she was amazed to discover – over three decades after his actual death – that Theodor Wacyk had led such a productive life. Together with her husband Alphonse, Ms. Bernard is currently writing a personal account of her voyage of discovery, which has led them to Poland, United States, Australia and Brazil. Click here to download a more comprehensive biography of Theodor Wacyk, including a description of exhibitions of his work, critical reviews and references.